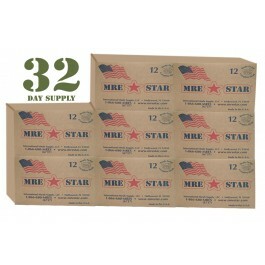 These 8 full MRE cases will provide you and your family with the food you need in any situation. Stock up on yours today. 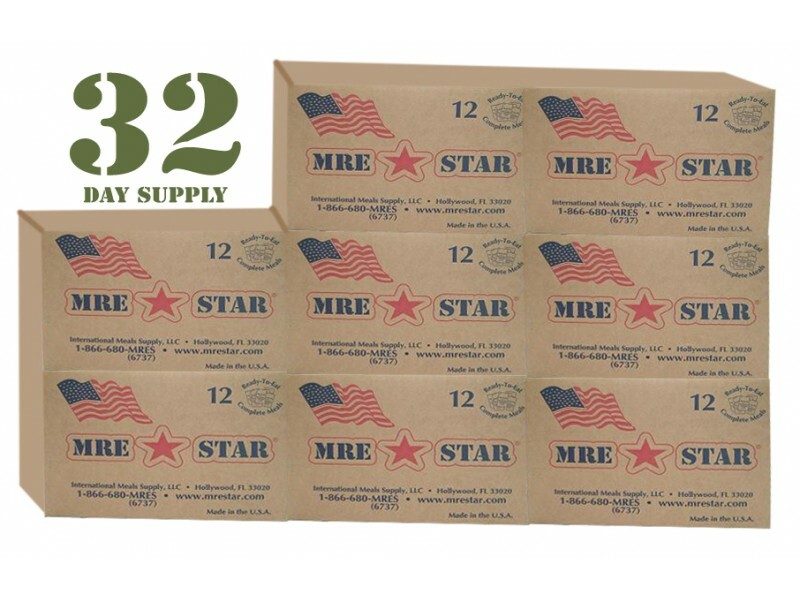 When you order this 8 MRE start full cases, you will get dozens of servings of food to help keep you and your family strong and healthy during any emergency. Each package includes beef stew, chicken and rice, vegetarian chili, pasta marinara, chicken noodle and pinto stew. In addition, you’ll get a variety of side items, which could be nut raisin mix, dry fruit, sugar cookies, high energy bar, crackers or tortillas. In addition to all the great food, you’ll get accessory packs that have a spoon, napkins, coffee, non-dairy creamer, sugar, salt, pepper and a wet nap. This makes it fast and easy to enjoy an entire meal without any problems. By ordering 8 cases of this food, you’ll have access to enough nutrients to get through the most common types of emergencies. Order this great pack today so you will have a great emergency food stockpile built up instantly. The food in these cases is all designed to have an extremely long shelf life, as well as taste great when you’re ready to eat it. Whether you are saving it for an emergency, or you take some of it with you camping or hiking, it is good to have these emergency food rations on hand. When you order this 8 MRE start full cases with heaters. you will get dozens of servings of food to help keep you and your family strong and healthy during any emergency. Each package includes beef stew, chicken and rice, vegetarian chili, pasta marinara, chicken noodle and pinto stew. In addition, you’ll get a variety of side items, which could be nut raisin mix, dry fruit, sugar cookies, high energy bar, crackers or tortillas. In addition to all the great food, you’ll get accessory packs that have a spoon, napkins, coffee, non-dairy creamer, sugar, salt, pepper and a wet nap. This makes it fast and easy to enjoy an entire meal without any problems. By ordering 8 cases of this food, you’ll have access to enough nutrients to get through the most common types of emergencies. Order this great pack today so you will have a great emergency food stockpile built up instantly. The food in these cases is all designed to have an extremely long shelf life, as well as taste great when you’re ready to eat it. Whether you are saving it for an emergency, or you take some of it with you camping or hiking, it is good to have these emergency food rations on hand.